DRIFT INTO BLISS within the cozy confines of the Yellow Leaf Queen Hammock. Wile the day away or set the scene for a lingering twilight conversation with a pitcher of lemonade or a bottle of wine. It's the perfect size for a hammocker or two! Create your own Yellow Leaf Queen Hammock- or give one as a gift! You can work with our "Hammock Concierge" to design your own one-of-a-kind creation. It will be "freshly woven" for you in the Mlabri Village, then shipped carbon-free to your home (FREE SHIPPING)! Your hammock will arrive with a "Hammocking 101" Guide and a repurposed parachute tote. Our hammocks are outdoor-friendly. Our yarn is weather-resistant & color-fast, so a Yellow Leaf Hammock can be left out all season without concern for rain or shine. * Optimal Hanging Height: About 5-6 ft.
* Optimal Hanging Distance: 9-10 ft.
* Product weight: 1.7 lbs. HOW DO I DESIGN MY OWN CUSTOM HAMMOCK? One of the most unique, exciting things about Yellow Leaf Hammocks is that they are completely customizable. If you have an idea, we can create a one-of-a-kind, freshly woven hammock to help you show your true colors to the world. 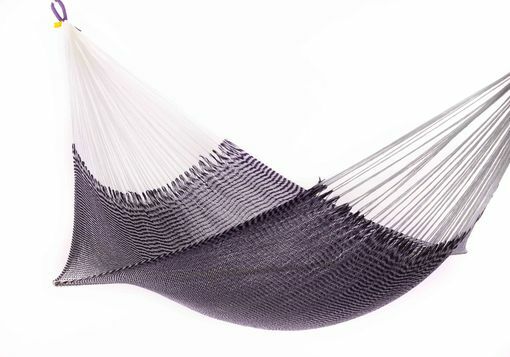 You can design your hammock from the yarn up! 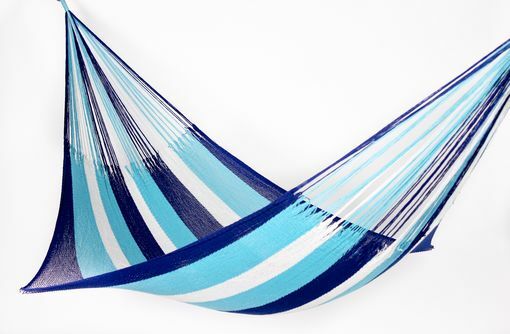 You will be able to select the size of hammock that suits your lifestyle, then select the colors you like best- or choose from our existing catalog! Your inspiration can come from anywhere: your favorite sports team, a beloved work of art, the color scheme in your kid's room. Our weaves have been technically engineered to contour to your body and leave you feeling lighter than air. The close-knit, free-flowing weave shifts with your movements to support you in any position and our yarn is cashmere soft. To achieve this level of unmatched comfort, each Yellow Leaf Hammock is 100% handwoven by an expert artisan weaver. It can take up to 10 days of work, 150,000 interwoven loops, and 4 and a half miles of yarn to create our most intricate designs! Although Yellow Leaf Hammocks appear delicate, they can actually support up to 550 lbs! Our superstrong microyarns are interlooped into our signature Triple Weave, a proprietary design that offers triple reinforcement at each connection point. A Yellow Leaf Hammock will endure through the seasons. These hammocks are weatherproof, and colorfast too! Their bright colors do not fade. Unlike other hammocks, they won't break down or pill. 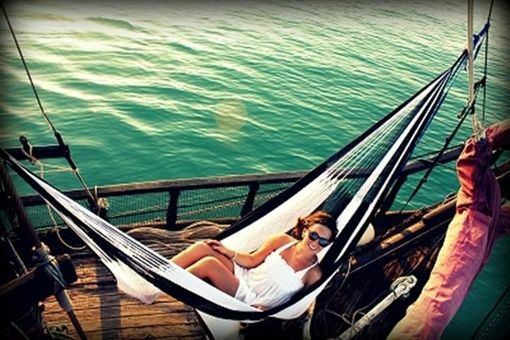 Each hammock comes in its own tote, made out of eco-friendly repurposed parachute material. All of our hammocks weigh 1-3 lbs, so they pack up perfectly for a day in the park or out on the boat.